However, often, inspecting a structure when it is completed is too late…. Time and material have been wasted and the structure needs to be re-built. 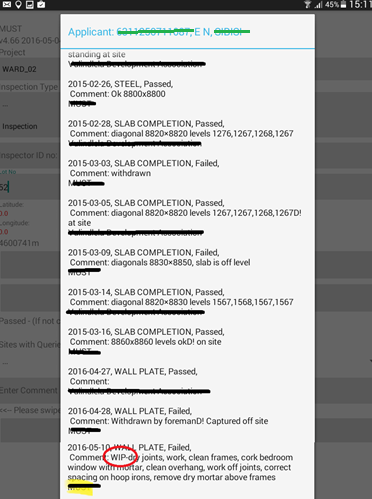 To make sure snags are caught early, and not only when stage completion inspections are taking place, ExalonQMS allows the inspector to do a separate set of inspections called WIP Inspections that mirror the normal inspections. These inspections do not constitute the basis for any claims etc… but serve only for management purposes and can be used as Site Instructions. These WIP inspections can be done as a regular exercise but also by a manager, foreman driving through a project and noticing snags that require immediate attention. He can from his vehicle do a quick inspection, take a picture and in the comment give a site instruction with remedial action required. All WIP inspections are viewed on a separate report and all the comments and pictures are available to stakeholders ensuring that all reported information is shared. Both normal and WIP inspections are gathered in the site history, so when a Lot Number is called on a device, every single inspection and comments associated to this house show the comprehensive construction history.